Apple intros Apple Card, A credit card with Apple Wallet integration, Daily Cash rewards and more. Apple today announced Apple Card, an innovative, new kind of credit card. Apple Card is built into the Apple Wallet app on iPhone, and offers compelling rewards program. Available in the US this summer, Apple Card transforms the entire credit card experience by simplifying the application process, eliminating fees and providing a new level of privacy and security. Apple Card is built into the Apple Wallet app on iPhone, offering customers a familiar experience with Apple Pay and the ability to manage their card right on iPhone. Apple Card transforms the entire credit card experience by simplifying the application process, eliminating fees, encouraging customers to pay less interest and providing a new level of privacy and security. Available in the US this summer, Apple Card also offers a clearer and more compelling rewards program than other credit cards with Daily Cash, which gives back a percentage of every purchase as cash on customers' Apple Cash card each day. Customers will receive a percentage of every Apple Card purchase amount back as Daily Cash. Unlike other cash back rewards, Daily Cash is added to customers' Apple Cash card each day and can be used right away for purchases using Apple Pay, to put toward their Apple Card balance or send to friends and family in Messages. Every time customers use Apple Card with Apple Pay, they will receive 2 percent Daily Cash. Customers will also get 3 percent Daily Cash on all purchases made directly with Apple, including at Apple Stores, on the App Store and for Apple services. There are no fees associated with Apple Card: no annual, late, international or over-the-limit fees. 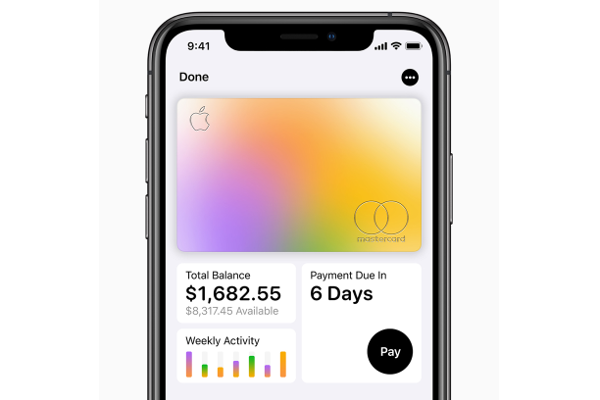 Apple Card's goal is to provide interest rates that are among the lowest in the industry and if a customer misses a payment, they will not be charged a penalty rate.